Work has continued, experimenting with these low cost but potentially highly capable video adaptor boards. I believe I have found the cause of the occasional white speckles seen on the display. The default setting for the GBS-82XX board is to clock the 166 MHZ speed grade SDRAM at 162 MHz. It appears to be worse if the Hynix HY57V643220DT-6 is fitted compared to the EtronTech EM638325TS-6G device, which appears to be fine. Whilst the signal is a bit noisy, it does not violate the +/-2V overshoot/undershoot limits of the SDRAM devices used. The simplest fix was to reduce the SDRAM clock speed to 129.6 MHz, with a single I2C write. This has fixed the issue. Halving the SDRAM speed to 81 MHz caused distortion on the video, the next speed increment of 108 MHz was sufficient for 1360×768 pixel output. A proper fix would be to adjust the timing of the DQM strobes with regard to the data bus as on SDRAM the DQM strobes clock the data out of the SDRAM. If this is adjusted, you also need to consider the timing of the SDRAM clock to the control bus (RAS, CAS, CKE, CS, BS0/1 and WE) and the Data bus. This is not too difficult if you have the PCB artworks as you can measure the PCB track lengths and adjust the timing by 7ps/mm. With the GBS-82XX board, it would be tricky and fraught with false starts. We could of course measure it and adjust accordingly, or reduce the clock speed by 20% and have more timing margin (an extra nanosecond) on the clock. Now that the speckling problem appears to be fixed, I am looking at some general video quality issues. When using a 50 Hz PAL screen-mode, scan-converted to 60 Hz, there are some noise bands, particularly noticeable on a grey Workbench background. It is hoped that some digital filtering/sampling will help alleviate this. I have experimented with different ways to synchronise the GBS-82XX device. As those of you that have experimented with the board now, sometimes it can be a bit ‘hit and miss’ with the video source (games console or computer). The TVIA-5725 accepts a 3.3V TTL signal, via a Schmitt input, this changes logic levels slightly so a logic 1 is 2.4V to 3.3V, and a logic 0 is 0 to 1.0V. The 680 Ohm resistor works as the GBS-82XX follows the Vesa VSIS specification, which requires synchronisation inputs to have a 2K impedance to ground. 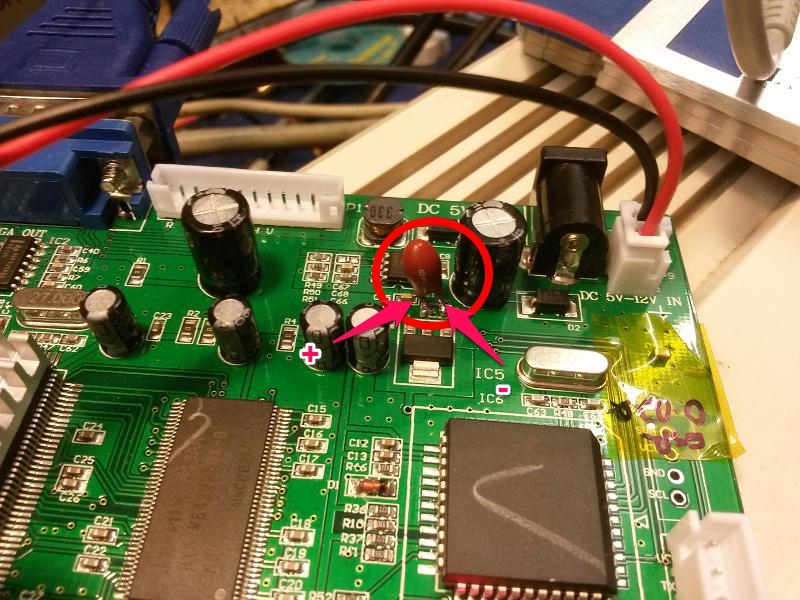 My 680 ohm resistor (+47 ohms in the Amiga), creates a potential divider, reducing the signal level to a safer level. This is cheap and easy to implement and does not degrade the video sync significantly. A number of people use the venerable LM1881 video sync separator, any device or circuit that uses this, should have the 680 ohm resistor added as shown above. The LM1881 outputs 4-5V sync levels that are not compatible with the GBS-82XX/TVIA-5725. Alternative devices are the EL1883 or the LMH1980 but they are not available in hobbyist friendly DIP packaging. I have tested the LMH1980 with the Amiga, I used the composite video output of the A1200 to create LVTTL (3.3V) HSYNC, VSYNC and CSYNC. 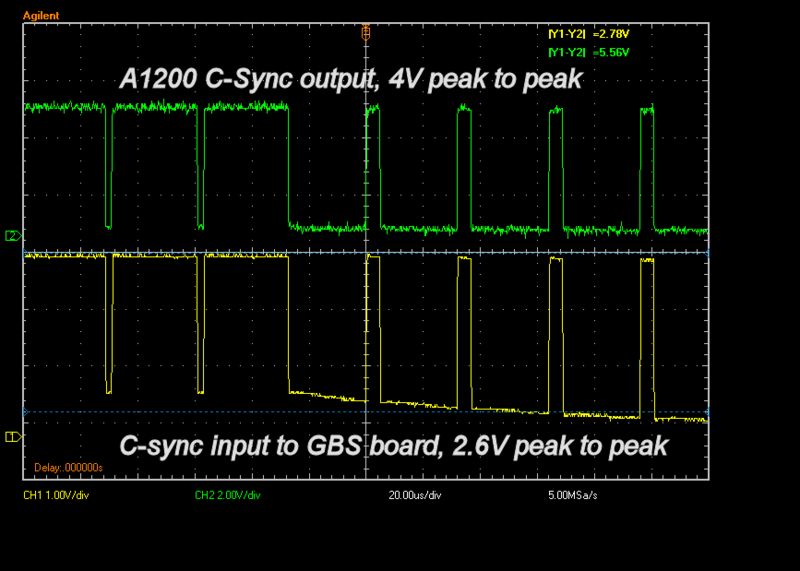 The GBS-8200 I have synchronised with the CSYNC perfectly, the same as using a resistor. It did not work reliably when I supplied separate HSYNC and VSYNC, I had a very wavy display. A final note, the GBS-8200 did synchronise to the Composite video output of the A1200 but it is not recommended. The 2V (approx) video contains colour information that is not filtered out and would in all eventualities, cause problems at a later date. I have been reading numerous web-forums on GBS-8200/GBS-8220 problems to look for common trends and solutions. One topic that crops up a lot is related to the power supplies. I have already proven, in part one, that a 5V 2A supply is not required. During my testing, I noticed an occasional, high frequency, burst of noise, on the +3.3V supply. I traced it back through the circuit to the power input. 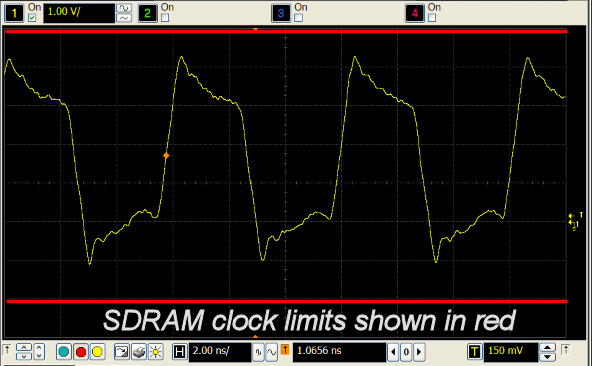 Changing the timebase of the oscilloscope, I spotted something important, it happened at 20ms/50Hz intervals. In the UK and Europe, the AC mains operates at 50Hz so when you see a 50Hz noise pulse, you know where it came from. Currently my GBS-8200 is powered from my bench power supply, built 20 years ago, with 3 linear regulators and still on the original electrolytic capacitors. Also connected to the +5V output was my 5V to 3.3V TTL buffer board. Two of the eight inputs were in use, the other six were floating. I made a mistake here. 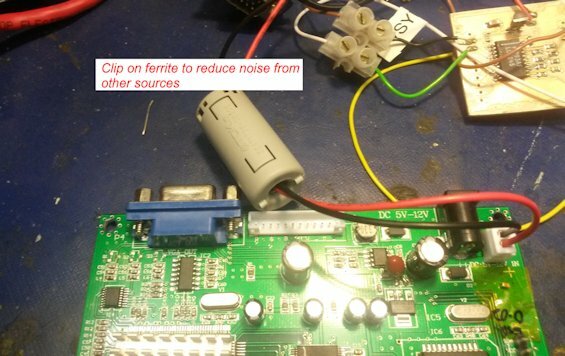 You should never leave TTL inputs unconnected, they will pick up noise and oscillate, in this instance, they picked up 50Hz mains noise. Quickly dis-connecting the buffer board, removed the noise. The 3.3V (switchmode) and 1.8V (linear) regulator supplies now have about 20-30mV of noise, perfectly acceptable. You can see the buffer board in the top right of the photo. Whilst this ferrite was a little large, it did cut the noise out. If you are using the DC power jack (the black plug) either pick a PSU that has a ferrite fitted or measure the cable diameter and purchase a clip-on ferrite from a local supplier or ebay. I spent two hours trying to work out where the noise was coming from, reading datasheets and measuring the board. To date I have changed a single capacitor on the board. I briefly touched on this in my first post but after additional testing, I am happy to confirm it needs changing. The 1.8V regulator is used for the core supply of the TVIA-5725. with a ceramic capacitor, I was able to cause the power supply to glitch by switching my overhead inepection light on/off or my soldering iron transformer. Since changing it to a 16V, 22uF, tantalum bead capacitor, this has not happened. The original capacitor, shown under Kapton tape, had an ESR of 0.02 ohm, the recommended range for the LM1117 (similar to the AMS1117 used here) is 0.3 to 22 ohms! The part I fitted had an ESR of around 2 ohms. Some people ask what the final software settings solution will be? This would be used to read and write the I2C commands to the TVIA-5725 device which provides the video scaling functions, among others. It is readily available and clones can be cheaply procured, finally it can be easily updated using the Arduino environment. My aim is to make the design data readily available, for free. This will include the video settings. I’ve seen too many scammers on ebay selling ‘Amiga modified’ equipment for extortionate prices, I will not have this solution exploited. 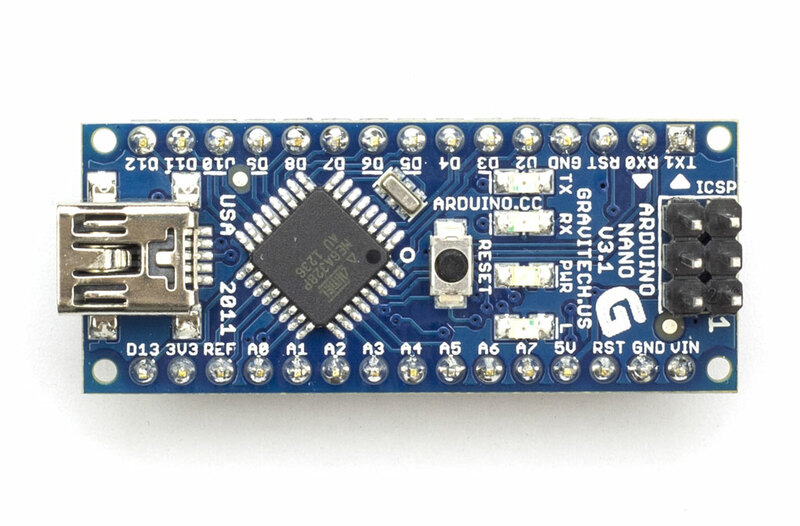 Another option, still using the Arduino approach is a module that piggybacks on the 8051 microcontroller clone on the GBS board. This would allow access to the onboard switches and no wiring. The downside is it would be more expensive. Until the final settings are known, the end solution is fluid. Sorry for the lack of updates recently, life, the universe and everything else has interfered. It’s continuing at a reasonable pace. I am behind schedule but I have defined a list of 15 critical tasks that need to be completed before a prototype PCB can be sent for manufacture. I have currently ticked off 3 items. A diversion, now a planned task, was the IDE interface. The original idea was to utilise the IDE68K design as-is. This has not proven to be the case. When drawing out the schematic I noticed that a few 68EC020 signals were missing. After re-reading the manual, I noticed a few differences. The MC68000 and MC68EC020 output some signals at different clock phases. So the existing design would need some tweaks. Alexh over at EAB converted the ABEL code to VHDL (my preferred HDL). When I compiled it, targeted at the XC9572, as used originally, it did not fit, it needed 74 macrocells from a 72 macrocell part. As no parts had been ordered at this stage, it was easily swapped to a 144 macrocell XC95144 device, as used for the MIA CPLD. To verify the IDE interface and eventually the Memory Interface Adaptor (MIA) design, I need a 68020 testbench to stimulate both designs. The last time I wrote a VHDL test bench was back in the advanced VHDL training class, back in January 2012, so I’m a little rusty. One of my personal development aims for this project was to improve my VHDL/CPLD skills. So what I thought would be an easy tasks, grew in size. I must be confident that the IDE interface and the MIA CPLD will work before committing to hardware. Reading some of the user feedback on the IDE68K design reinforces this decision. I typically have a few hours a week for my design projects, the little details can easily take the available time but I would rather find them now when it is easier and cheaper to fix them. Not sure If it has been made clear but the design is intended to fit inside the CD32, similar to the venerable DCE SX32. Indeed, the PCB footprint will be no larger than this, though I expect a smaller PCB. I would not start a project if I could not fund it and I will not accept funding for pre-orders. The current development phase will have 3 prototype cards, that has been funded from the profits made from the current range of Amiga adaptor PCBs I sell. Ordering of critical components has commenced, the first batch arrived today and other components will be ordered shortly. If it seems like I am being very harsh shooting down extra design features, I have good reason, feature creep can kill a project. It will take some time to finish the first 3 prototypes. I have added some expansion connectors to allow me to trial other ideas later but without a prototype PCB, other features are a moot point. Some features, like making the IDE/compact flash slot accessible from the side of the CD32 are accommodatable adding network interfaces or even an SD card interface add cost and complexity. Once I have some working prototypes, I can experiment, then other features may get added. Cost is a big issue for the design. Of the expected £120 retail cost, around £50 of that cost is in the manufacturing of the PCB and assembly of the module. Work is ongoing to lower the module costs. XC95144 CPLD, SRAM, Compact flash connector and the 5V/3.3V logic. I looked at adding a Real Time Clock, with parallel interface, it would have cost more than the CPLDs! Well it worked in the simulations!? Time for a slight change of topic, leaving project Hermes for a while and detailing some of the fun of developing ‘simpler’ circuits. I have just finished a long over-due update of a simple, single supply audio mixer, primarily aimed at the Amiga, details are here: http://www.ianstedman.co.uk/Amiga/designs/Audio_Mixer_MK2/audio_mixer_mk2.html, this is a simple design, based on a classic summing amplifier. For the original prototype, designed back in 2012, I simulated the circuit using a SPICE simulator, all worked well, tracked the PCB, ordered a PCB and built it. It did not work! The output of the op-amps was a DC level, it would not respond to any input stimulus. I isolated the other input, in case this was causing an offset, no joy, isolated the inverting output stage, no joy. Left the workshop tired and confused before I did something crazy. The design uses an LM358 operational amplifier, nothing special, it’s a voltage feedback device that can run off a single supply. It was the single supply that was part of the problem. I created a 1/2Vcc reference, buffered by another LM358, for the other devices to use, this worked. , this is achieved by adding a 10K resistor from the output to the negative supply, which is GND for a single supply. Ironically, if you use a non-inverting amplifier, the Vq resistor is not required, but to have a summing amplifier (to mix audio signals) requires an inverting amplifier. So based on simulations which worked well, I spent £40 getting two PCBs fabricated, which did not work! An expensive lesson learnt. It also show the importance of a prototype to prove the theory. It took about two years to go from the prototype to a final PCB, which is now available to purchase (marketing plug), http://www.ianstedman.co.uk/Sales/sales.html. The final design works well, even if I do say so myself. The frequency response has improved slightly, it covers the full 20Hz to 20KHz range, more than I can hear, it cures the harshness of the left/right Amiga audio output and looks quite nice. There is one final tweak to the design, which involves a few component changes. The ‘Better Paula’ circuit implementation, is slightly wrong. It requires a different mix ratio, which thankfully is just a few resistor changes. I will test this shortly and update the MP3 samples on my website. This audio mixer was a simple design, which all told, with design, re-design (grr), PCB tracking, component selection and website updates to document it all has taken around 30 hours to develop. Surprising but not un-expected. That’s all for now. Back to digital electronics. It’s been a while since my last post and as one of the aims was to use a blog to provide more updates, I need to get busy. It might not look the most exciting diagram but it helped to plan the design. From this it was easy to get a feel for the number of I/O pins for the CPLDs, it showed me where I need the 5V/3.3V logic translation and what discretes were needed. The design has three discretes/jumpers. The first is an enable/disable jumper (or switch). If A game refuses to work with the extra RAM, you can easily disable the whole card. PATA should not be affected but is to be confirmed. There are another two discretes are related to the floppy drive interface. The first input tells the CPLD if either a PC(default) or Amiga floppy drive is connected. This is so I can crossover the important signals (CHNG/RDY) and generate the RDY signal. The other discrete input/jumper is if a duall floppy drive cable is used with a twist, it will again allow me to crossover signals. The floppy interface by default supports PC floppy drives as they are cheaper to obtain. The final option is a 4MB/8MB RAM selector. To cut costs, this would allow a system with 4MB of RAM. May not be used. From this diagram I sketched out (but have not shown here) the top level blocks of the Memory and Interface Adaptor (MIA) CPLD. This helps me plan a logical flow for the CPLD. Without this I would not have thought of some of the extra switch inputs. This might seem crazy and it has delayed me a little bit but I took the decision to change the CAD software I use. Since 2002 I have used Cadsoft EagleCAD, a fine tool I know well. I currently use V5.11, which is stable and does most of what I need. One of the limitations is PCB area. Up until now, a 160x100mm PCB area has been sufficient. This design might be greater than that. I currently have a standard license, which costs 690 Euros+VAT. To move to the Professional edition, for a larger PCB area, the license is 1385 Euro+VAT! As a registered user, my upgrade costs are slightly reduced. The software upgrade costs would out-strip any money I make from this project, so a cheaper solution was required, enter DesignSpark PCB. Designspark has had a learning curve, sometime steep but it was not unexpected. I have had to create a few schematic and layout symbols but that is inevitable and a good chance to learn. The online help is Ok but a bit lacking in some areas (took a while to find how to easily edit existing library symbols and download many of them). No schematic tool is perfect though. In addition to Eagle CAD I also use Mentor Graphics schematic tools in my day job, sometimes I try shortcuts from one tool in another. One area I do plan to use Designspark PCB for is the 3D modelling and mechanical design. It easily creates a 3D view of the PCB, from within the package. With Eagle I have to run a script, export to Sketchup and render, not as easy as one click. In the future, I will put the Designspark Mechanical training to use and export my PCB into a 3D model. Ok I need to create a basic model of say a CD32 enclosure and a clockport card but it will help. No pain no gain. I have some ideas of how to make a product tester, this has helped with the design a little as it made me added a few test signals to the edge connector and also how to easily verify a batch of boards. This will be asked so I might as well say how it is going. The basic schematics I had have been re-drawn in Designspark. It was mainly some TTL logic, RAM and a CPLD. The bulk of the remaining schematic work depends on the MIA CPLD design. This will drive the device pinout, taking into account PCB routing. Future efforts will focus on this device. My CPLD design skills are Ok, they need to improve, one of the aims of this project. I will not have a prototype PCB by the end of June 2014 as I planned. A finished schematic diagram would be good and a mostly finished CPLD is my aim by the end of June. There is still some static timing analysis to be done, around the CPU and SRAM interfaces but I need to finish some of this to constrain the CPLD timing. The plan after it has been tracked is for 2-4 prototypes, they will get comprehensively tested and from there, depending on interest, look at production. I hope to have another update early July. I thought I would share some of the decisions made whilst selecting the components for the design and how they impact the overall design, in terms of cost, complexity and testability. Low cost, around the £5 to £10 unit price in small quantities. Available in density from 36 to 288 Macrocells. 5V tolerant, this reduce the amount of external logic. Work with the free vendor design tools. Xilinx was selected as my preferred logic vendor as I have previous experience with the devices at both a PCB implementation and at HDL level. The majority of the design uses 3.3V logic, if the chosen CPLD can be 5V tolerant, it reduces the need for 5V to 3.3V level translation on some input only signals, like the address bus and the control bus. This is not a key feature. The number of macrocells and I/O count was surprisingly more important. The basic IDE interface required 71 I/O pins and 81 macrocells and 137 functional blocks. Factor in the extra I/O for a floppy interface and the address decode for the RAM and you have over 100 I/O pins. An important selection criteria, for any CPLD (Xilinx, Altera or Lattice) was availability in a PQFP package as I want to avoid the BGA options. These devices tend to be limited to a 208 pin PQFP package, in up to 144 macrocells for Xilinx. Whilst the device may have 208 pins, it may only have around 100 I/O pins. The safest way to implement all the required logic is to split it across two devices as I do not want to use more than 70% of the resources (excluding pin count) of a device, to give some room for changes/routing. The IDE design is borrowed from the IDE68K project which fills a 72 macrocell CPLD. The existing CPLD design could be re-used as-is and the PCB tracked to suit? Adding the SRAM memory interface and autoconfig logic (borrowed from the A608 DRAM controller which takes 22 macrocells, and 32 pins) , into another low cost CPLD seems to be a sensible split. This would be logical to add the clockport interface to. It has been glossed over but the memory interface uses SRAM not DRAM. Component availability and simplicity of design were the key points. It is possible to procure new SRAM devices, either the Alliance, AS6C1616-55TIN, a 55ns 16 Mbit (2Mbyte) or the R1LV1616RSA-5SI#B0 could be used. They share a common 48 pin TSOP package, allowing the lowest cost part to be used. A 55ns speed grade is fine when connected to the 14 MHz (69ns) system clock of the CD32’s 68EC020 microprocessor as it takes 3 clock cycles (about 220ns) to do anything. Once the timing diagrams are finished I will publish them here. A DRAM controller and SIMM socket would be £20-30 cheaper to implement but the lack of new SIMM sticks and the potential headache of supporting multiple , old, and potentially bad, SIMM modules, makes a common SRAM solution easier to support. The PCB will be a 4 layer board. The cost differential was £4 per board moving from 2 layer to 4 layer but it makes the tracking so much easier as the inner two layers can be power planes with limited tracking if required. This also facilitates a controlled impedance board, important if ‘245 type buffers are used to translate 5V to 3.3V, as they have 10-20 ohm output drivers, which with appropriate series resistors, will facilitate fixing the signal integrity issues that will occur. Once the above have been taken into account, the detailed design can begin. 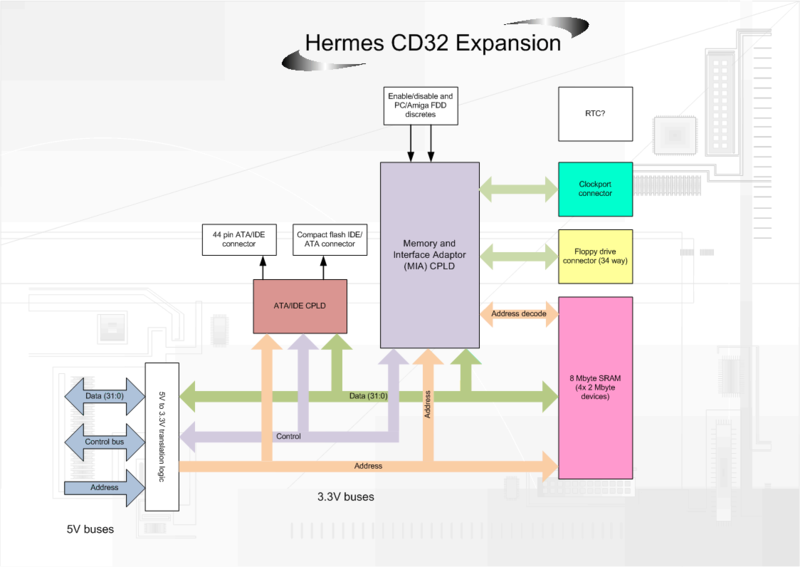 Project Hermes was the codename for an expansion card for the venerable, Amiga CD32 games console, spurned from discussions on the EAB web-forum http://eab.abime.net/showthread.php?t=72361. The aim is for this blog to be used to track developments and get feedback from fellow users. This wordpress site will also be used to try out the format and will detail non-amiga projects too. My main website, http://www.ianstedman.co.uk, is still active. The design aim is to produce a couple of prototype expansion boards that allow the CD32 to function as a a fully fledged computer, akin to the Paravision SX-1 or DCE SX32/Pro expansions from the 1990’s. The idea is to provide an affordable, modern alternative to these units. The author owns a DCE SX-32 Pro unit, which with hard drive cost £600 back in 1997! A new expansion board will cost considerably less than this. Parallel ATA (IDE) port + Compact flash connector. Floppy port, capable of accepting Amiga or PC floppy drives and floppy emulators. Clockport connector to allow for I/O expansions. Enable/disable logic + switch, for those old games. The question will inevitably be asked, why no accelerator? A CPU upgrade will add extra cost and break compatibility with some games, the CD32 after all is a games console. Yes some games would benefit from a faster CPU but the FPGA accelerator technologies, freely available, in the author’s opinion are not ready for use without adding significant risk to the project. Why is SRAM used not a SIMM socket? Stability. Even a slow 70ns SRAM, will operate with zero wait states on a 14 MHz MC68EC020 (71ns)bus that takes 3 clock cycles to do anything. Whilst a SIMM slot would be much cheaper to add than SRAM, £1 compared to around £20 for 8 MB of SRAM, age of devices and support are primary concerns. SIMMS are obsolete technology, you can easily buy them from ebay and some old computer shops. Their reliability and speed grades are unknown. Size and speed detection can be troublesome. By supplying a ready-built system with RAM, you do not have the worry about finding suitable parts, this reduces the support costs. Crowd-funding is being considered for this project.